This food has nothing to do with sub-atomic particles! In cooking, quark is a fresh dairy product that is most popular in central and northern Europe, particularly in German-speaking countries and Scandinavia. It is also popular among Slavic people. In Poland, it is called twaróg, in the Netherlands kwark, whilst it is known as kvarg in Norway and Sweden and творог in Russia. Quark is made by warming soured milk until it causes the whey in the milk to split from the curd, and then the solids are gathered up and turned into quark. The use of quark has been recorded as long ago as the 14th century. In Roman times, the historian Tacitus records that a Germanic people ate a sort of thick milk which could well have been quark. Interestingly, and unlike so many other traditional foods and particularly cheeses, quark seems not to have been introduced by settlers or immigrants to North America and has only recently been discovered in countries outside Europe. This may be because such a fresh cheese would have been difficult to keep for long in the days prior to refrigeration, both in the home and in shops or restaurants. In most countries where it is eaten, versatile quark is consumed at any moment of the day, from breakfast to supper, in snacks and main dishes and in sweet and savoury recipes. It can be, and often is, used instead of yoghurt. 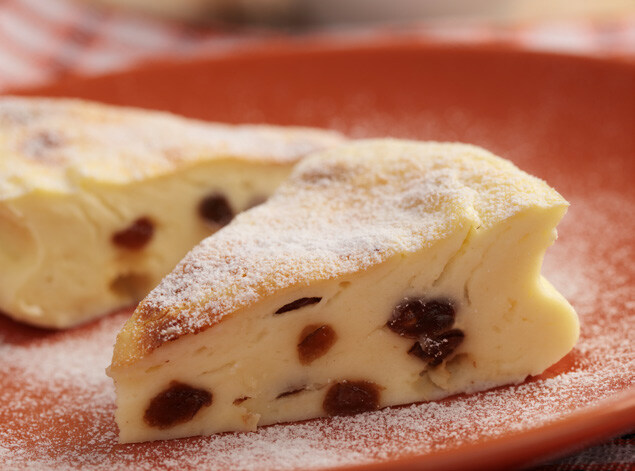 It is a special favourite for use in tarts, so the Swiss have their quarktorte, the Germans prepare quarkkuchen or käsekuchen, the Czechs make tvarohovnik, the Poles sernik and the Dutch kwarktaart. However, it now seems that quark is making new conquests, particularly among the younger generations. Quark fits in perfectly as a delicious food for those paying attention to a balanced diet and healthy eating. As well as providing minerals such as calcium, which we need to have strong bones, quark is naturally low in fat and high in protein and it has the added advantage of making us feel fuller for longer, so the temptation to snack is easier to resist. Quark is a thoroughly modern food of the 21st century and it may well be thanks to its newly-promoted nutritional aspects that quark is now gaining increased popularity and even being produced in places. Mix butter and sugar together, add the egg yolk. Sift the flour and baking powder and add to the mixture. Cool down in the fridge and roll out to 6 mm. Make the sablée dough and roll out to 6 mm. Cut to size with the tart ring and put base on a baking tray. Pipe the Deli Quark* in the middle and decorate with some non-baked Florex crunchy. Bake for approx. 35 min at 180°C. Allow to cool down and finish with Harmony Neutral* (glaze). Decorate with some baked Florex crunchy and an orange slice. Bulk fermentation Laminate dough at 7 mm, 30 min freezer. Then make two single folds at 7 mm with Mimetic. Allow to rest for another 30 min in fridge at 5°C. Make a final single fold and roll out to 3.5 mm. Freeze Deli Quark* in small slipmats. Put in after proof and Sunset Glaze*. Pipe Deli Yema* also into donut shaped slipmats. For round caramel decoration, mix 70 g brown sugar and 30 g Florex* (sugar mix) together. Place in small slipmats and bake at 180°C. Deli Quark is is the ideal product to easily make all traditional quark recipes you are entitled to.